t Get there early enough to get a seat where your child can see and hear easily. t Ask an usher for a worship bag and use it with your child. t Enjoy the trumpets, drums and other special musical instruments. t Stand short children on their pew when the congregation stands so they can see more easily and can sing and speak in the middle of the sound rather than under it. 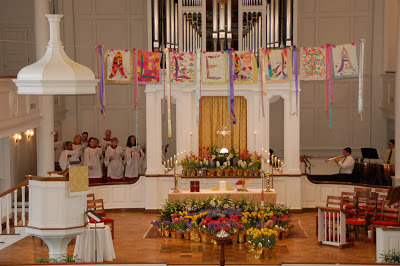 t Help children sing every “Alleluia!” in the Easter hymns even if they can’t read the other words. Together count the alleluias in one song or in the whole service. To do the latter make a hash or write an A in the margin of your bulletin each time you hears, sing or say the word. t If you have a storybook about the empty tomb or a Jesus storybook that includes the empty tomb story, hand it to your child as the sermon begins. t If your congregation passes the peace, help your child pass the peace to everyone around you. t Make all your comments about the crowd positive. Be happy to see how many people think the Easter story is important. Point out that they care enough to dress in their best and come to hear it and sing about it with everyone else. t (After the service) take a picture of your family in the sanctuary or outside with the church building in the background to remind yourselves that you were here. t Remember, you are creating memories. Some of them will be warm and wonderful. Others will lead to family eye-rolling stories told for years to come. All them shape lives.